I haven't had much time to get into my craft room at all lately. But I did need some creative therapy this weekend and so I got in there and made a pretty, sparkly card and got started on my Project Life-style cruise album. For this card I used an older tree stamp from JudiKins that I had bought at a flea market awhile back. I inked it with Stampin' Up! 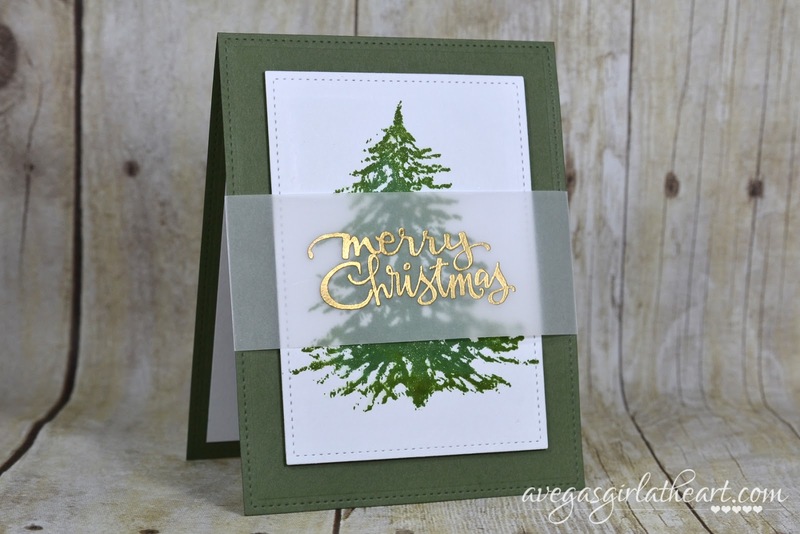 's Garden Green, and then rolled just the edges in Stampin' Up! 's Mossy Meadow. I liked that the edges of the tree were a little darker by doing this. Once I had my image I die cut it with the Lawn Fawn Large Stitched Rectangle dies. I attached it to my card front (which I also cut with the dies - only I folded my card stock first and lined it up so that the top part didn't get cut, only perforated) with foam tape. Then I added glitter with my Wink of Stella brush pen. For my sentiment, I used the Technique Tuesday Christmas Cheer stamp set and stamped with Versamark onto white vellum. I used Stampin' Up! 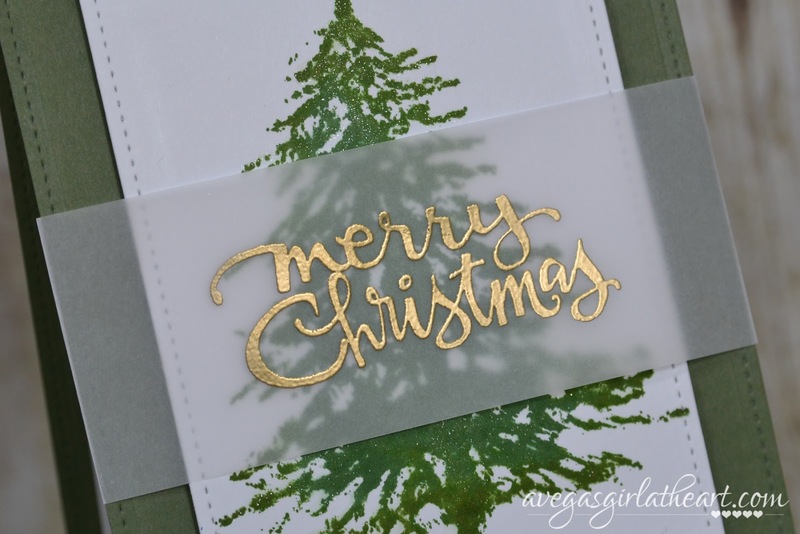 gold embossing powder and heat set it. Finally I wrapped the edges of my vellum tightly around my card and attached inside with some Multi Matte Medium adhesive. I'll be sending this to someone I know, and I don't think it matters that you can see the vellum on the inside of the card, but you could always cover that with a panel of card stock on the inside. Love how this one turned out! It was fairly simple to make but I think the gold over the sparkly tree makes a big impact. Melissa, I can see this being this years Christmas cards, Simple and Perfect ! Thank you for sharing. Happy to hear you had a great vacation, and everything went great.